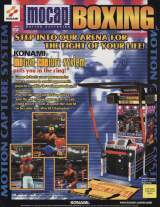 Mocap Boxing © 2001 Konami Corp.
'MOCAP' stands for 'MOtion CAPturing'. 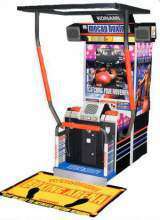 It was presented at the February 2001 AOU (Arcade Operators Union) in Japan. Michael Jackson used to own this game (Serial number: A29251). It was sold at the official Michael Jackson Auction on Apr. 24th, 2009.